Thanksgiving brings all family and friends together for a big meal, a fun game of football, and maybe even a Turkey Trot 5K run. We talk about Black Friday ads, Christmas shopping /events. Its a big day. I usually hold it as an Open house/ Buffet style meal for those that have family and visit others, and friends pop in. I look forward to it. This year is no exception. We will rise and run a 5K, after the turkey is put in the oven. The sides are prepared the night before and will be completed upon our return from the race. It actually may sound more complicated than it really it. I make the table favors, that actually will house Andes mints, since everyone loves that at some time during the day. 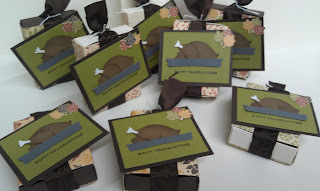 I also made some for the craft fair, and they loved them. 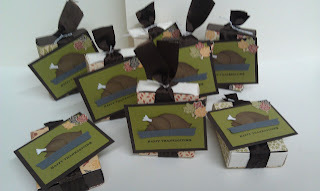 Of course I need like 20 for my day- and made 40, so I am pretty much a pro now on the "turkey" making part! 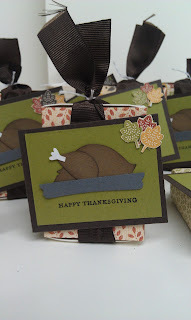 Using the matchbox die to create the boxes, and a series of punches for the turkey. I used some retired SU! paper for the favors, when it ran out I used solid colors found in the designer paper, so it looks pretty among the bowl. these are so cute, can I come eat at your house?